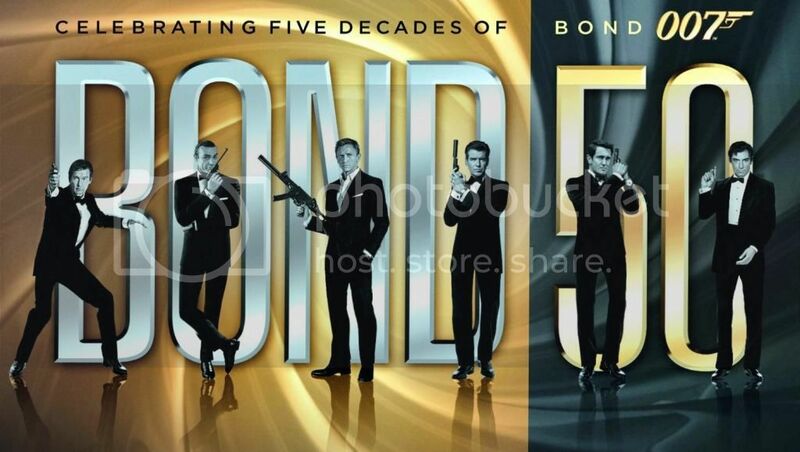 Fifty plus years of Bond, James Bond. 007. The enduring legacy of Ian Fleming's iconic character has far exceeded even his wildest dreams when he first created the character sixty or so years ago. Fleming did an amazing job of creating a character that would resonate for decades and generations that would follow his introduction to the world in the first 007 novel, Casino Royale. From the plain, ordinary name, James Bond, to his personality and his skillset, to the supporting characters, Ian Fleming got it right from the word, "Go." Translating that character to the big screen was a challenge. Albert 'Cubby' Broccoli and Harry Saltzman both believed that they were up to the challenge, and when they combined forces to make James Bond movies they got everything right, too. Director Terence Young was an inspired choice, as he imprinted some of his own personality on the character. Sean Connery was tutored by Young in how to be James Bond. The lessons he learned from Young were put to good use over 6 official Bond movies (and one unofficial one, years later). Over the decades six men have played James Bond on the big screen. Sean Connery, George Lazenby, Roger Moore, Timothy Dalton, Pierce Brosnan, and, currently, Daniel Craig, have all brought their own take on the character to their respective 007 films. Each Bond actor has done well in at least one area, although Lazenby's inexperience did show a bit at times. The Bond phenomenon (both literary and cinematic) has developed legions of fans over the last six decades, and favorite books and movies among those fans varies fairly wildly. Some Bond movies have been better received at the box office or by the critics than others, but all of them have a lasting appeal. Even the weakest James Bond movies still have a strong entertainment value. That was something that both Cubby Broccoli and Harry Saltzman wanted to make sure was always there - entertainment value. They achieved that goal, a goal still pursued by Broccoli's daughter, Barbara, and his stepson, Michael G. Wilson, as they carry on the tradition and produce the movies as part of a moviemaking family business. But which ones are the best? And which ones leave something to be desired? That, of course, is a matter of personal taste and opinion, but that won't stop us from giving you the Vista Records rankings of The Best To Worst James Bond Movies. 1. Licence To Kill - This is a taut thriller with a fantastic performance from Timothy Dalton. His performance is subtle in places, dymanic in others, but always realistic. You really feel Bond's pain in this one, and root for him to get revenge. John Glen made the most of a small budget with this one, with some great action sequences. The pacing is excellent as editor John Grover gives the movie a chance to breathe in between the action sequences, highlighting the great character moments in the film. Robert Davi is also excellent as the villain of the movie, Franz Sanchez, a mirror image of Bond. 2. Dr. No - Bond came to the big screen for the first time in this exciting thriller loaded with suspense and adventure. It is, essentially, an international detective movie, and on that count it is done very, very well. Sean Connery nails the role from the beginning thanks to some help from director Terence Young (who did a phenomenal job on this one and it's follow up). 3. From Russia With Love - Terence Young, Sean Connery, and company take everything good about Dr. No and make it better in the first Bond Sequel. So why is it listed below Dr. No? The locations were more scenic in Dr. No, and that movie was just fresher. Both movies are great, but Dr. No just looks and feels newer and fresher. On all other counts, though, From Russia With Love is a slightly superior movie. You can't lose with either one. 4. Thunderball - Overrated at #4? Maybe. Maybe not. It is the follow up to From Russia With Love that Goldfinger wasn't. Goldfinger was a left turn that hinted at the Roger Moore era. Thunderball is a step back on to the path tread by both Dr. No and From Russia With Love. It's also a slight step down in quality from those two, but not by much. Terence Young returned to the director's chair for this one (after having to miss Goldfinger due to scheduling conflicts), and he did another great job. Adjusted for inflation this is by far the most successful Bond movie ever at the box office. 5. Skyfall - And this is the most successful Bond movie at the box office since Thunderball. Daniel Craig has made the James Bond role his own. He hasn't tried to emulate any particular previous Bond actor, but he does show bits of both Sean Connery and Timothy Dalton in his performances. Skyfall is an amazing film to look at as it was beautifully photographed by Roger Deakins (under the direction of Sam Mendes). The action scenes in this one are definitely among the best in the series, and despite a couple lapses in logic the overal plot and script is excellent. 1) LIVE & LET DIE - My first Bond. Favorite theme song. J.W. Pepper. Baron Samedi. Albert the dirty great big crocodile. 2) LICENSE TO KILL - Bond on the revenge trail. Dalton was criminally underrated. 3) CASINO ROYALE - As close to Fleming's Bond as we're likely to get. When Craig got the carpet beater treatment, I was wincing. 4) Skyfall- A villain to rank up with the greats like Blofeld, Goldfinger & Dr No. We learn more about M & 007's pasts. 5) GOLDENEYE - Debut Of Brosnan. Rogue agent Vs Top Agent. Brilliant theme song.